So I'm about a week late with my last book review, but I finally got around to it. 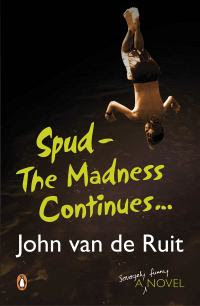 I read Spud - The Madness Continues ... by John van de Ruit. So, as I said, I am about a week late in getting this review up. Guess that's a fairly good reflection of the impact this book had on my life. This was a decidedly average read in my opinion, but as I said before when I read the first one it's probably better if you're a boy and went to boarding school. But I do enjoy knowing it's a South African book and it does reference a few things I remember from my youth. Right, so yesterday was by all accounts a shocker. Work did *not* end well. Out customers are basically dictating to us something that should be entirely our call ... and it wasn't a case of "oh, how about we do this". No, no, no, it was one of those "By the way, we've already decided you're going to be doing this" things that leave you feeling all warm and fuzzy and "wishing for an atomic bomb to show up gift wrapped at their house" inside. Nice, hey? I mean, forget the fact that you've hired experts (compared to them) in the field, forget that they think what you're proposing is monumentally stupid, forget that they have now lost all respect for you and go ahead and do it anyway. Because that's right, you're the customer and that makes you God. So, I walked out of here fuming, as one would expect. And proceeded to bump my car into the first available person. It's okay, their car is fine. My car is pretty much fine too, the bumper has just move about 10mm. It was annoying and although technically my fault, I blame the traffic cops / police (they were going so fast I couldn't tell which, plus I was more focussed on my recent accident) who raced thru their red robot (it was green for us so excuse me for thinking that meant I could drive!) with their sirens blaring causing "Car B" (as per the accident report) to stop suddenly. From my vantage point ,I heard the sirens, but could not see yet where they were coming from ... so was certainly not prepared for the sudden stop. Anyway, so that just improved my moods ten-fold. It's always a bad idea to drive when fuming. I spent the rest of it recovering with a bubble bath and a few more episodes of Weeds. Sheesh.